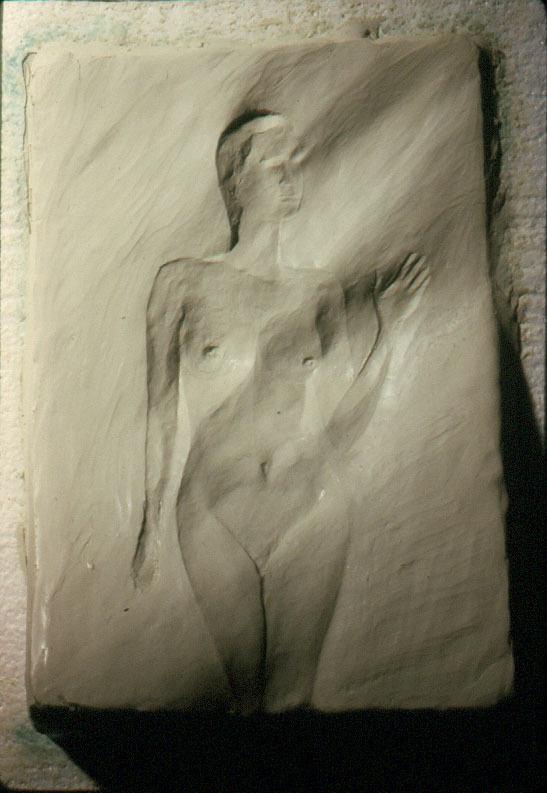 ​My early reliefs employed a single light source to create an coherent image that could be recognized (Gestalt). 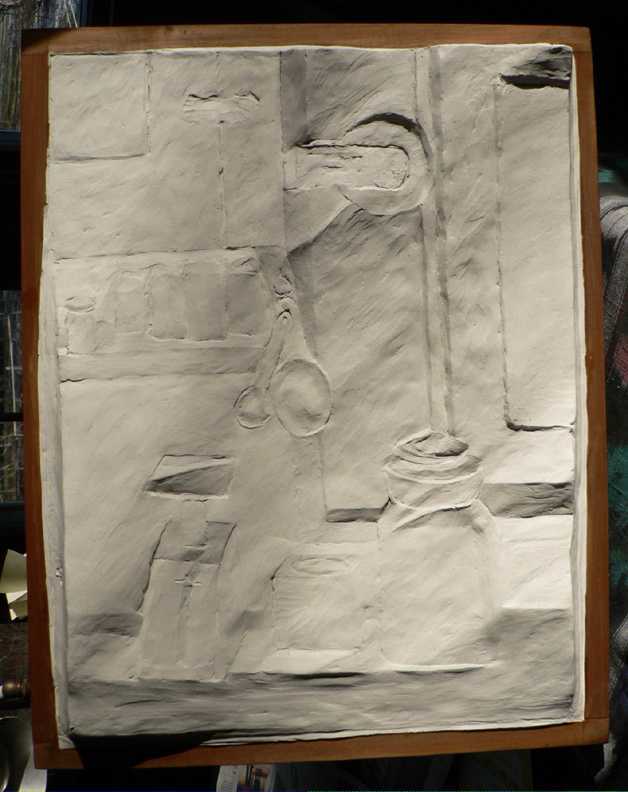 My early reliefs were positive reliefs made using a light shining on the piece from the lower left (I am right handed; this light direction was chosen so my hand would not cast a shadow on the piece while making it). These early reliefs were only visually coherent when lit by a light attached to the relief on the lower left. If that light source was turned off and the relief lit from some other direction, the image became incoherent. Some examples are shown below. 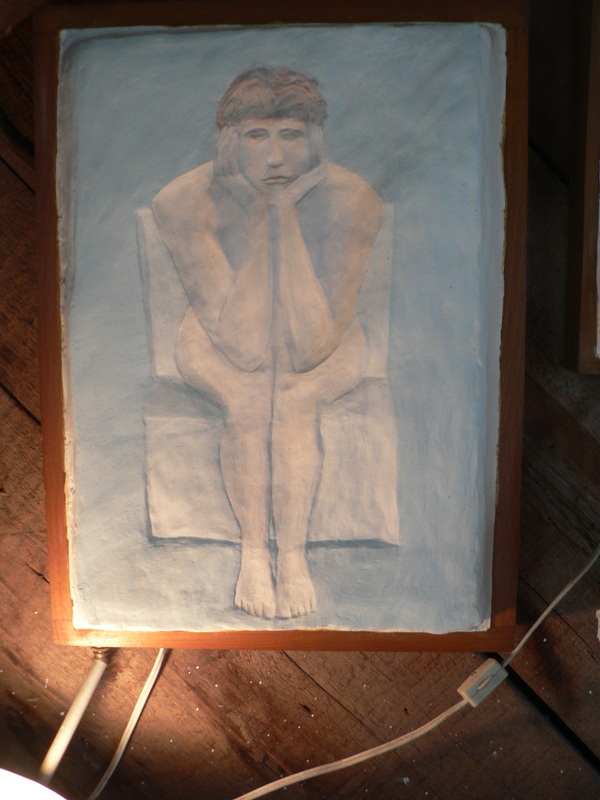 The expression, “Seen in a different light” is apropos to my reliefs, since a relief will change its appearance, sometimes dramatically, when its lighting changes during the day, or at night with artificial light. Some examples of how a relief will change with different light directions are shown below. 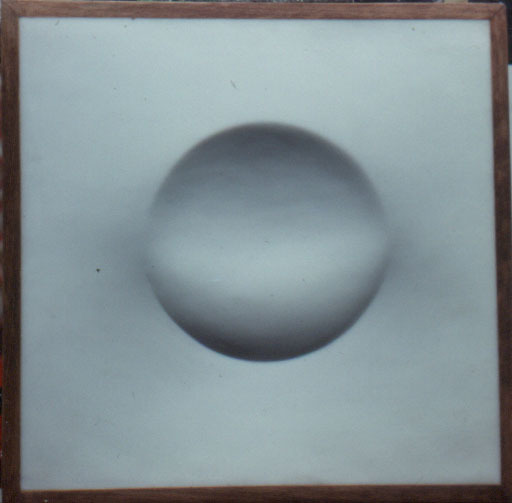 Here are four photographs of relief # 1977-03 "The Sphere" which is made of wax. 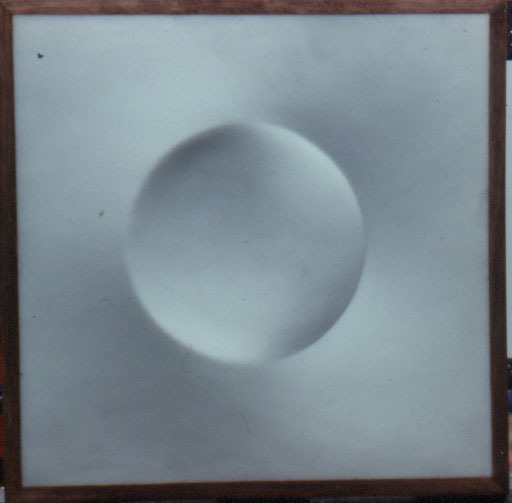 Each photograph shows the relief lit from a single light source, rotated 90 degrees. Window; one lit from the lower left and one lit from the upper right. These fixed light reliefs were difficult to exhibit in group shows since the gallery lighting interfered with the fixed light. So I began to explore how to make reliefs that would be coherent in various lighting. This exploration continued from about 1982 to 1996. I worked with clay, making casts in polyester resin using latex molds, in carved styrofoam covered with a mixture of white glue, clay and powdered cellulose, colored with water color and acrylic. 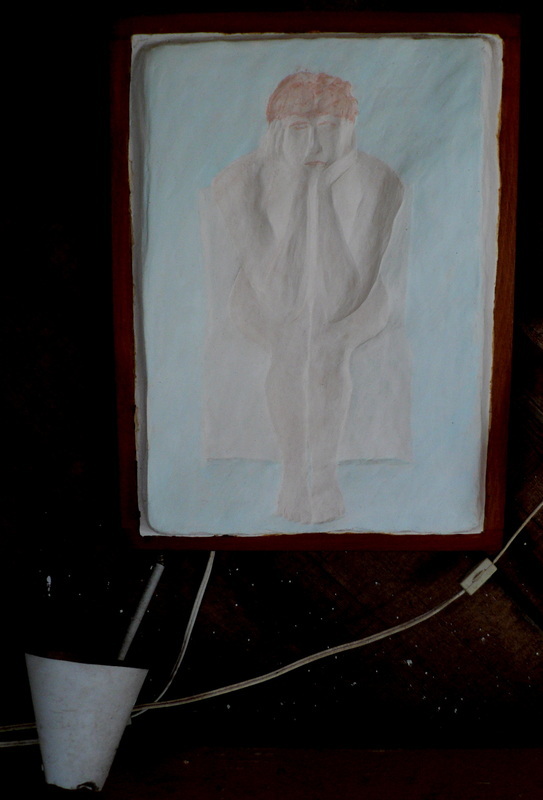 Finally I made hundreds of small, relatively thin tablet reliefs of white glue, clay and cellulose which were air dried. Photos of some of them are shown in the slide show below. 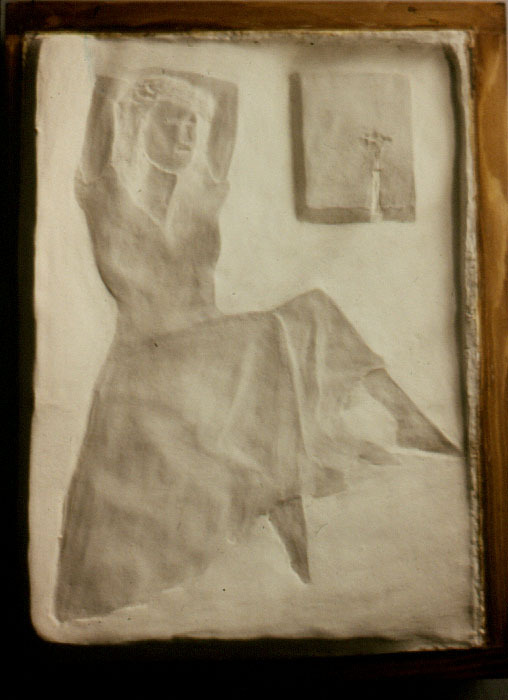 Since about 1996 I have concentrated on intaglio relief, especially the white ones, which present a coherent image in a variety of lighting situations, although certain directions will work better than others. 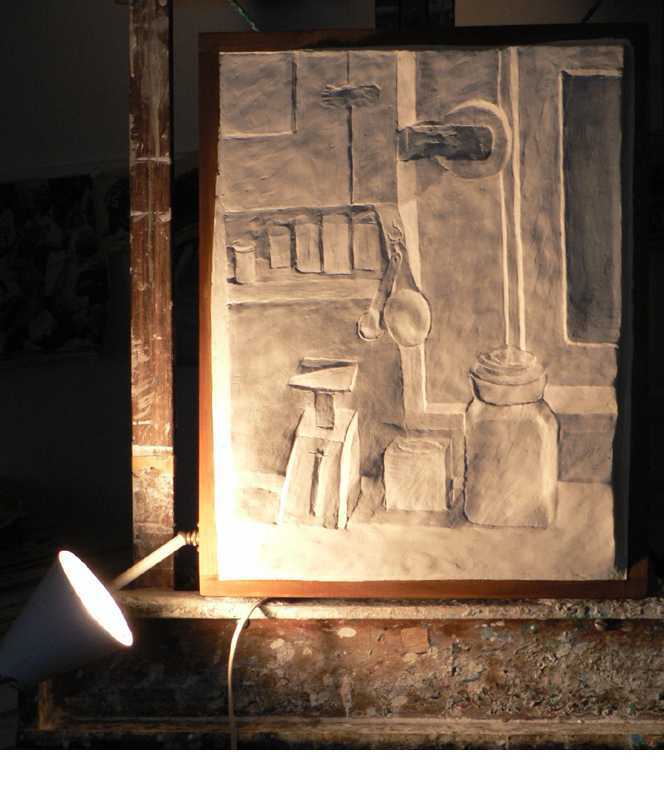 In order to accomplish this, I eliminated the illusion of cast shadows previously present in my reliefs, cast shadows being dependent on the light direction. 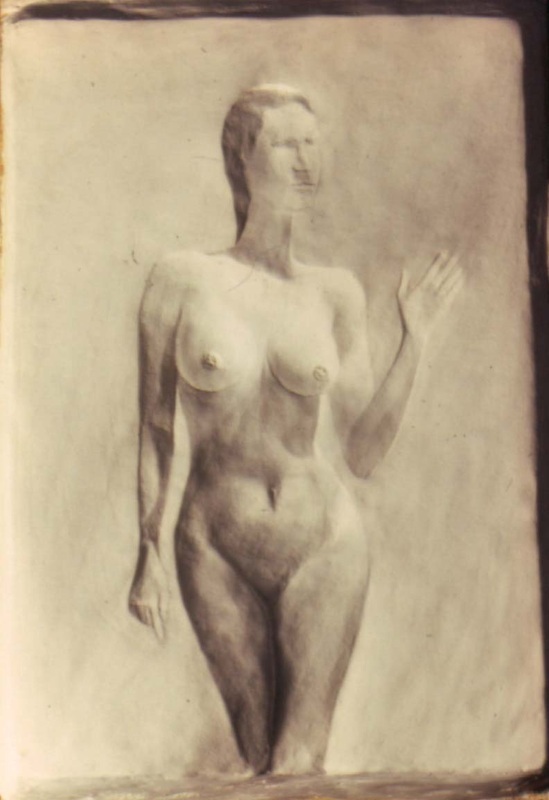 These intaglio reliefs exhibit a kind of holographic image that seems to float on the surface of the piece. 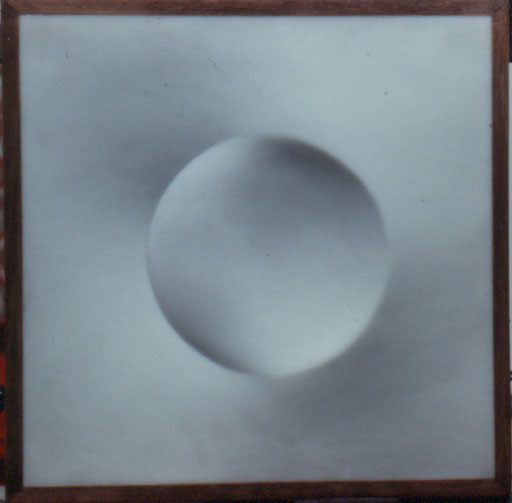 Faces, objects and spaces move in opposition to the viewer’s movement. Some care should be taking in hanging and lighting my reliefs. 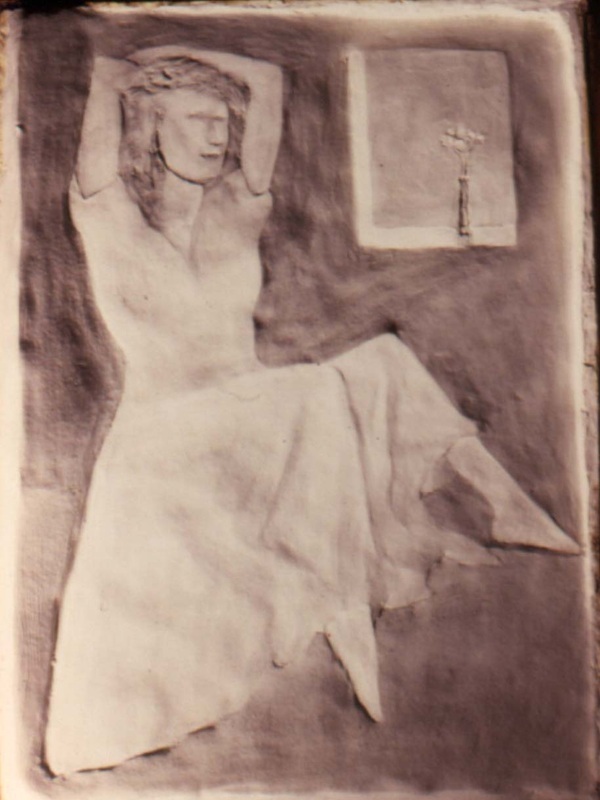 Ideally, a relief should be hung on a wall where it can be viewed it from different angles and at a distance one might view an impressionist work. 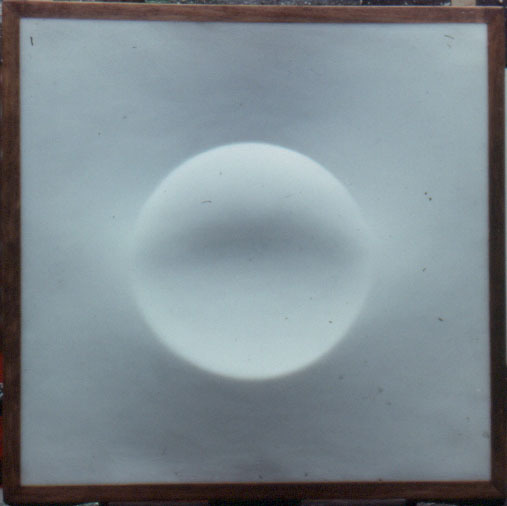 Each relief responds to light somewhat differently. Lit from below most reliefs present a strong, positive image. Lit from above, they appear to be lit from below. Side lighting will also work. The more acute the angle between the light and the surface, the greater the relief effect, until a point is reached where cast shadows begin to interfere. Indirect, natural light is usually works well. One shuld avoid multiple directional gallery type lighting which will washe out the relief image. In a windowed room a relief will undergo subtle changes in appearance as the light changes from morning to afternoon to night. 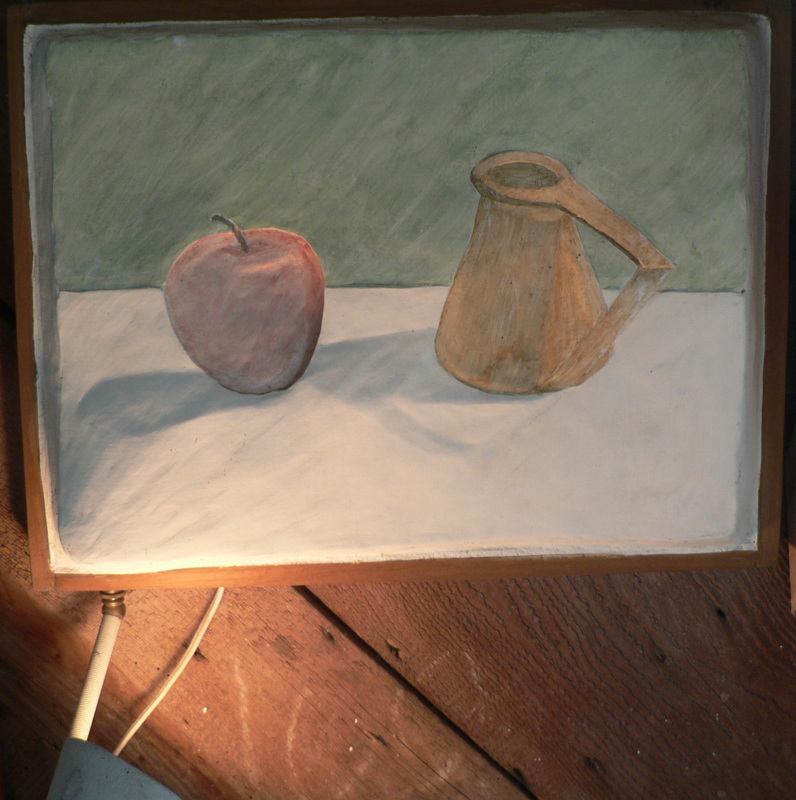 If hung in a room with a south facing window, the piece may at times be illuminated from sunlight bouncing off the floor or walls. The white pieces often reflect color from outside or from nearby objects. At night, the relief will present an entirely different appearance depending on the type and direction of the artificial light. Lit from below, say from a table lamp, the relief image may be enhanced since it will conform to the way we normally view objects, appearing to be lit from above. 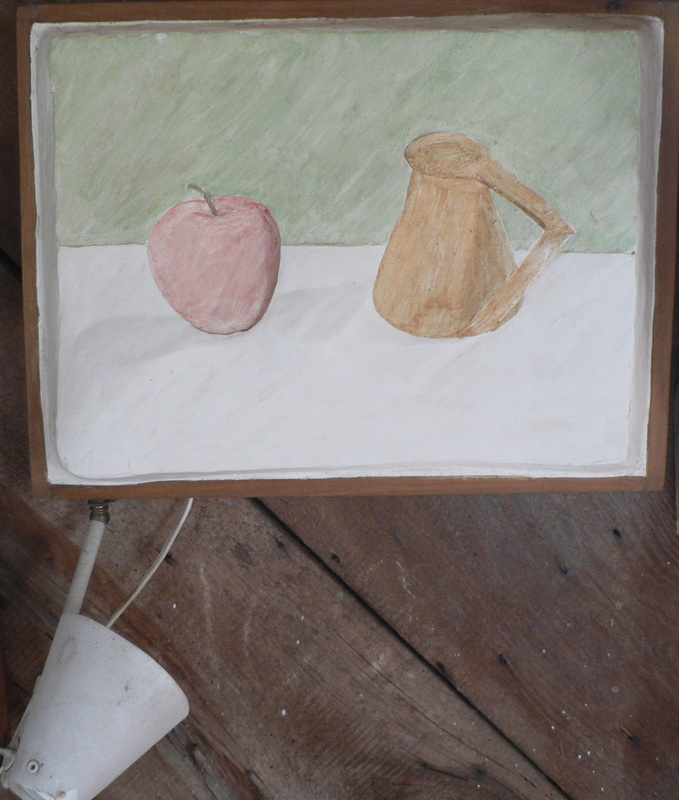 A relief will also alter its appearance when hung at different heights. Viewers are encouraged to try different hanging and lighting arrangements.